Single-cell RNA sequencing (scRNA-Seq) is an emerging technology that has revolutionized the research of the tumor heterogeneity. However, the highly sparse data matrices generated by the technology have posed an obstacle to the analysis of differential gene regulatory networks. Addressing the challenges, this study presents, as far as we know, the first bioinformatics tool for scRNA-Seq-based differential network analysis (scdNet). The tool features a sample size adjustment of gene-gene correlation, comparison of inter-state correlations, and construction of differential networks. A simulation analysis demonstrated the power of scdNet in the analyses of sparse scRNA-Seq data matrices, with low requirement on the sample size, high computation efficiency, and tolerance of sequencing noises. Applying the tool to analyze two datasets of single circulating tumor cells (CTCs) of prostate cancer and early mouse embryos, our data demonstrated that differential gene regulation plays crucial roles in anti-androgen resistance and early embryonic development. Overall, the tool is widely applicable to datasets generated by the emerging technology to bring biological insights into tumor heterogeneity and other studies. MATLAB implementation of scdNet is available at https://github.com/ChenLabGCCRI/scdNet. Single-cell sequencing is a developing technology that enables a close look into the heterogeneity and clonal evolution of cancer cells. While many methods have been designed to analyze single-cell DNA-Seq data , the analysis of scRNA-Seq data remains challenging due to high sparsity that prevents direct applications of methods originally developed for microarray and bulk RNA sequencing. On the other hand, the analysis of gene regulatory networks is a widely used approach to realize the signaling and interactions among genes. Recent studies have successfully applied correlation onto the inference of gene regulatory networks by using scRNA-Seq data [2, 3]. However, realizing that tumor cells are highly heterogeneous, network topologies may be massively changed between cells of different cellular states . Recently, a computational method was proposed to investigate the change in mean absolute distances of a gene to others . However, the computational method for studying individual gene pairs of which regulatory strengths alter between conditions was only carried out in the bulk RNA sequencing data [6–8]. Addressing this research need, here we developed a comprehensive bioinformatics tool for single cell-based differential network analysis, namely scdNet. It features two main functions: i) gene correlation analysis out of highly sparse data matrices and ii) differential network analysis between cellular states. Performance of scdNet was tested by simulated datasets. We further applied the tool to scRNA-Seq datasets of CTCs and early-stage mouse embryos for differential networks associated with anti-androgen resistance of prostate cancer and early embryonic development. Elements of the interaction matrix followed the standard normal distribution. , where erf() and sgn() are the Gauss error function and sign function, respectively. Given the exact CDF of the changes in the interaction values, P-values are directly assessed and time-consuming permutation or simulation tests can be avoided. Gene pairs with significant changes were defined as differential pairs and merged into a differential network. Networks of identified genes and their dynamic interactions across cellular states were visualized by the Cytoscape software (version 3.5.1) , with nodes and edges denoting genes and differential gene regulations, respectively. To investigate the functional relevance of cellular state-modulated differential networks, top hub genes of the network were analyzed for the associations with Gene Ontology (GO) terms of molecular functions, cellular components, and biological processes by the Database for Annotation, Visualization and Integrated Discovery (DAVID) . scdNet is devised to analyze differential gene regulatory networks associated with cellular states at the single cell level. Fig. 1 shows the flowchart of the tool. Briefly, scRNA-Seq data were preprocessed and normalized to eliminate inter-cell biases, and non-informative genes with a coefficient of variation < 0.25 in either state were eleminated. Within each group of cells, gene-gene correlation coefficients were calculated with an exclusion of zeros, and transformed to a sample size independent domain by the Fisher transformation to eliminate sample size related biases. 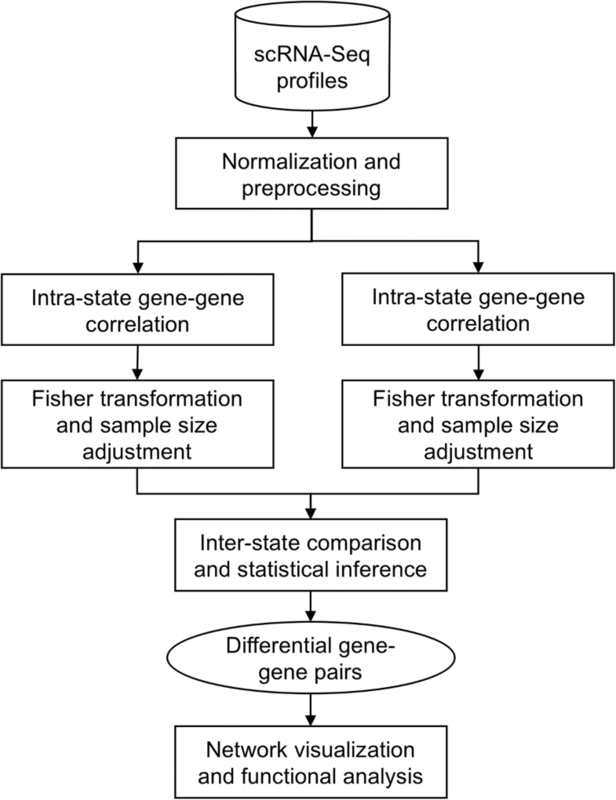 Normalized correlation coefficients were compared between groups of cells and the changes in correlation were statistically tested in the Fisher domain. 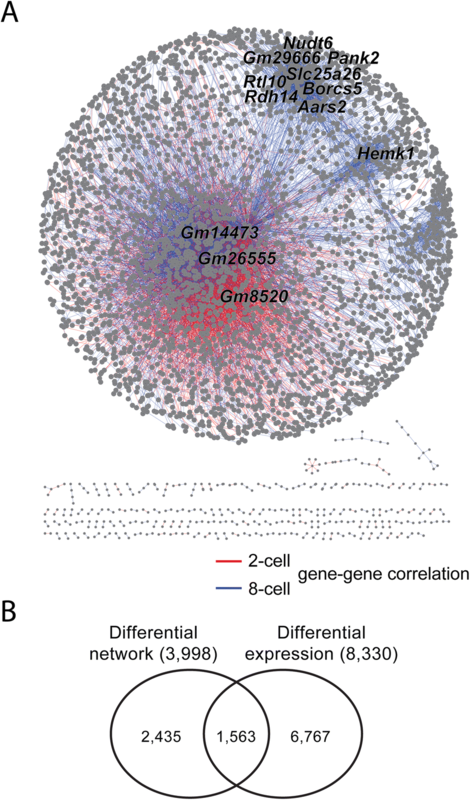 Significantly changed gene-gene pairs were merged into a differential network. Visualization and functional annotation analyses were performed to realize the biological relevance of such dynamic network. MATLAB implementation of scdNet is available at https://github.com/ChenLabGCCRI/scdNet. We simulated scRNA-Seq datasets to test the performance of the proposed method in analyzing gene-gene correlations out of highly sparse scRNA-Seq data. Since we z-transformed the sequencing data, the synthetic datasets were generated by randomly sampling the standard normal distribution. We note that the performance of the comparison of interaction matrices (Eqs. 4–5) has been described in our previous papers [7, 8]. Thus, the simulation was simply focused on the comparison of intra-group correlations against zero (uncorrelated). In each simulation scenario, 10,000 gene pairs were generated, of which 20% were defined as correlated (covariance=θ), and the remaining 80% as independent (covariance = 0). Four parameters were tuned in the simulation: i) covariance of correlated gene pairs (θ, 0, 0.3, 0.7, and 1.0), ii) relative power of Gaussian noises added to the original signals to mimic sequencing errors (ε, 0, 0.05, 0.1, 0.25, 0.50, 0.75, 0.9, and 1.0), iii) number of single cells (K, 10, 20, 50,100, and 200), and iv) proportions of low-signal elements to be eliminated (representing zeroes of scRNA-Seq) (τ, 0, 0.25, 0.50, 0.75. 0.9, and 0.95). Yielded Fisher-transformed scores were compared to zero; gene pairs with Bonferroni-adjusted P-value< 0.05 were called as significant. Performance was evaluated by accuracy, sensitivity, specificity, and time consumption. The simulation processes were performed on MATLAB. With ε, K, and τ set at 0.05, 50, 0.25, respectively, we tested the performance of scdNet across different gene-gene covariance θ. As shown in Fig. 2a, the increase in θ greatly rose sensitivity from to 0.14 to 1.00 (θ=0 and 1.0) and slightly increased accuracy from 0.70 to 0.88. On the other hand, specificity seemed to be independent of θ (range, 0.84–0.85). We then tested the effect of sequencing noises. Simulation settings were identical as described above, while θ was fixed at 0.7. At a general level of sequencing errors (ε=0.1), scdNet achieved high performance (accuracy, sensitivity, and specificity = 0.86, 0.90, and 0.85). While accuracy and specificity were not sensitive to ε, the sensitivity dropped to 0.40 when the noise was extremely high (Fig. 2b). Due to limitations in budget and specimens, scRNA-Seq data are typically of limited sample sizes. To realize the effects of sample size and sparsity of scRNA-Seq data, we jointly analyzed the two factors. As shown in Table 1, the proposed tool achieved generally favorable performance in regardless of settings of K and τ when either group of cells had 10 or more non-zero values. Facilitated by the exact probability function (Eq. 5), scdNet is of remarkably high computation efficiency. An inference of 10,000 gene pairs described above took an average of 1.3 s (std., 0.5) on a personal computer. We then applied scdNet to a real dataset derived from prostate CTCs. CTCs is an emerging technology of liquid biopsies that allows minimally invasive assessment and prediction of metastasis and treatment outcomes of advanced prostate cancer [12, 13]. Here we studied on the resistance of enzalutamide, a second-generation anti-androgen medication which is used in the treatment of prostate cancer [14, 15] while its resistance mechanisms remain vague. Thus, we utilized a public dataset of 169 scRNA-Seq of prostate CTCs (Gene Expression Omnibus accession number: GSE67980) . We normalized raw read counts by DESeq2. The dataset was found very sparse. Among 21,696 unique genes, each cell carried an average of ~ 76.4% genes (16,573, std., 2293) with no sequencing reads. We analyzed 77 samples isolated from 13 patients, of which 41 progressed on enzalutamide (hereafter referred to as the enzalutamide-resistant group) and 36 were enzalutamide-naïve. Out of ~ 4.7 million transcriptome-wide gene pairs, we set a stringent criterion to identify the most significant subset of pairs that exhibited significant changes between the two groups (Bonferroni adjusted P < 1 × 10− 5). In total, 6023 and 10,670 pairs of genes were correlated with each other specifically in enzalutamide-resistant and -naïve groups, respectively, involving 2735 genes. These gene pairs formed a highly intertwined network (Fig. 3a); on average, each gene was connected to 12.2 partner genes. We note that only 2.8% of these genes were differentially expressed (with t-test P < 0.05) between the two groups of cells, confirming that our analysis was not biased by differential expression. (Fig. 3b). Table 2 tabulates the top 10 hub genes of the network. ENOSF1, a mitochondria enzyme that have been shown as a serum biomarker for gastric cancer , was the top hub with 150 differential pairs (Fig. 3c). Consistently, functional annotation analysis of the top 100 hub genes in the network also highlighted the association between mitochondria-related biological functions and anti-androgen resistance (Table 3). Thus, our data indicate differential gene regulatory networks, at least partially, govern mitochondria functions and play an essential role in anti-androgen resistance of prostate cancer. We also applied scdNet to study the differential network associated with early development of mouse embryos. We preprocessed scRNA-Seq data of 32 single cells at the 8-cell stage and 16 cells at the 2-cell stage (ArrayExpress accession number E-MTAB-3321 ) as described in the CTC study. The data were also highly sparse (68.6% sparsity). Using identical criteria, we identified 11,245 gene regulatory pairs specifically shown in 2-cell (2915 pairs) and 8-cell (8330) embryos composed of 3998 genes (Fig. 4a). Again, the proportion of these genes to be differentially expressed was lower than expectation (39.1% compared to an expectation of 49.0%; Fig. 4b). The top 100 hubs genes were significantly associated with cell division and differentiation-related functions, such as cytoskeleton and chromatin assembly, and the ribosome and mitochondria, which are known to regulate early development of mouse embryos [19, 20] (Table 4). Recent advances in scRNA-Seq technology have revolutionized the investigation of tumor heterogeneity [21–23] and construction of the cell atlas in human  and mouse . This study addresses the unmet demand for studying condition-specific gene regulatory network using scRNA-Seq data. We proposed and implemented a novel bioinformatics algorithm, scdNet, for systematic identification of gene pairs with regulatory strengths significantly changed between two groups of single cells. We adopted a sample-size correction transformation on correlation coefficients to cope with the sparsity of scRNA-Seq data. Using simulated datasets, we demonstrated the tolerance of scdNet to gene-gene covariances, relative power of noises, and number of single cells, as well as its great computational efficiency. We also applied the method to study two real-world datasets. CTC is a minimally invasive liquid biopsy strongly indicated for investigation of metastasis , prediction of treatment response [12, 13], and risk assessment of cancers [27, 28]. Our work is a unique extension into the underlying mechanisms of CTCs in treatment response of metastatic prostate cancer. By comparing CTCs obtained from patients responsive and naïve to a second-generation anti-androgen therapy, we constructed an intertwined gene regulatory network. Our data are in line with previous in vitro studies in the critical role of mitochondria and oxidative stress in the development of hormone-refractory prostate cancer [29–31]. In a non-cancer setting, scdNet also identified biologically meaningful results related to early development of mouse embryos. Overall, we demonstrated the feasibility of our method using simulated and real datasets. We expect the method to be widely applicable to different studies of biomedicine with the emerging applications of scRNA-Seq. Here we present a novel bioinformatics tool, namely scdNet, for a fast and comprehensive inference of differential gene regulatory networks out of scRNA-Seq data. Performance and computation efficiency of scdNet were demonstrated by simulation analysis. Applying the tool to a dataset of prostate cancer, we showed the involvement of mitochondria-related biological functions in anti-androgen resistance. We also illuminated crucial biological functions regulating early development of mouse embryos. Taken together, our data suggest wide applications of scdNet in exploring differential networks out of the rapidly increasing scRNA-Seq studies. Yu-Chiao Chiu and Tzu-Hung Hsiao contributed equally to this work. Publication charges for this article have been funded by Taichung Veterans General Hospital. This research was also supported by the Ministry of Science and Technology, Taiwan (MOST104-2314-B-038-044) to YJS; the National Health Research Institutes, Taiwan (NHRI-EX107-10710BC) to THH; the NCI Cancer Center Shared Resources (NIH-NCI P30CA54174), NIH (CTSA 1UL1RR025767–01), and CPRIT (RP160732) to YC; and San Antonio Life Science Institute (SALSI Postdoctoral Research Fellowship 2018) to YCC. The funding sources had no role in the design of the study and collection, analysis, and interpretation of data and in writing the manuscript. MATLAB implementation of scdNet is available at https://github.com/ChenLabGCCRI/scdNet. YCC, THH, LJW, YC, and YJS conceived the study. YCC, THH, and YC designed the model. YCC and LJW performed data analysis. YCC, THH, YC, and YJS interpreted the data. YCC, THH, LJW, YC, and YJS wrote and approved the final version of paper.